Atlantic Drywall specializes in smooth flat ceilings. To accomplish this we use the finest products and tools, including Mesh Tape, High Performance United States Gypsum Joint Compound, and a variety of anti-cracking United State Gypsum Easy Sands. Atlantic Drywall always uses experienced and quality drywallers to make sure your job is of the highest quality. As with all of our work, it's guaranteed and carries a warranty. Although many consider textured ceilings a thing of the past, when done right they can give an astonishingly pretty finish. Atlantic Drywall offers a variety of different textured ceilings and walls — done with joint compound or plaster. Atlantic Drywall can also offer the ability to patch texture surfaces caused by water damage and other problems seen with ageing or damaged drywall. Please feel free to contact us with more details. Looking for a high-end level-5 finish? Atlantic Drywall can accommodate your needs a number of ways. Click above to view video full screen. TUFF-HIDE primer-surfacer: Tuff-Hide produces an affordable Level-5 wallboard finish with an enhanced formulation that delivers whiter and smoother results than drywall primer. It applies quickly and evenly with professional airless spray equipment and generally does not require sanding. The primer is vinyl-acrylic, latex-based coating provides increased resistance to surface abrasion. The result is an ultra high-end look that can be painted after drying overnight (it can be left unpainted in ceiling applications where a flat, white finish is desired). Please feel free to contact us with any and all questions. Structo-Lite Plaster: Structo-lite plaster is a unique plaster that gives a “retro” finish similar to that of horse-hair plaster seen in earlier houses. However, Atlantic Drywall can offer smoother or rougher finishes with Structo-lite depending on the look you're going for. Like all level-5 finishes, structo-lite achieves highly durable walls and ceilings preventing from those easy nicks and dings you see with everyday wallboard. Structo-lite also provides thermal conductivity. 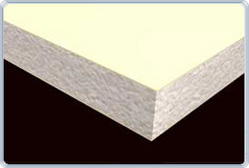 Its strong insulation properties provide a K factor of 1.74, three times the insulation value of other plasters. Fiberglass Reinforced Paneling is most often seen in restaurants and business bathrooms. These panels offer moisture resistance, impact resistance, and offer maximum sanitation protection. Atlantic Drywall installs FRP board using Fast Grab FRP Adhesive which is an environmentally superior (GreenChoice) product that contains no ozone-depleting chemicals. Unlike solvent-based adhesives, it is nonflammable, emits no harmful fumes and cleans up with water. Atlantic Drywall offers the service of metal framing, whether it's for commercial, residential, or tenant fit up Atlantic Drywall can fulfill your metal framing needs. Please contact us for further information or a free quote. We also offer many other mold and mildew resistant alternatives. Please contact for more information in regard to these mold and mildew preventions and for a free quote. Atlantic Drywall offers a multitude of solutions for sound proofing. Whether you're looking for sound deadening between apartments, or just looking to keep a room of your house more quiet than the rest, Atlantic Drywall can accommodate your needs. We have extensive experience using QuietRock, Green Glue, and Hushboard® Sound Deadening Board, among other Sound Proofing Solutions. Please contact us for more information regarding our Sound Proofing Solutions and for a free quote. Planning on trying your hand at drywall in a do it yourself fashion? Atlantic Drywall can still cater to your needs. We are able to deliver and stock your house or addition at a cheap and friendly cost. 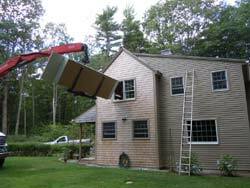 Save yourself the headache and strain of loading and unloading heavy drywall. Contact us for a price on delivered and stocked drywall. From start to finish Atlantic Drywall thrives on using the best material offered in the drywall world. We use only the finest wallboard in the country. Depending on your needs you will receive only premium wallboard from one of the companies listed below, installed by experienced and specialist contractors. Please visit the links below for more information on the wallboard we use. 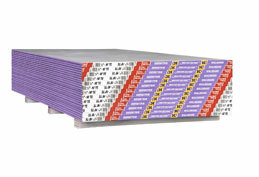 Atlantic Drywall only uses the finest tapes and joint compounds for a perfect finish and for crack prevention. Our experienced and excellent tapers use a specialized set of steps for the purpose of a perfect finish and to take all the steps of preventing any cracking. 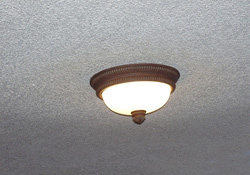 We are also one of the few companies in the area that uses No-Coat Corner Bead and No-Coat Off-Angles. No-Coat corner bead system is a new revolutionary way of doing corners with little to no chance of failing in comparison to metal corner bead. A perfect drywall finish requires a perfect sanding performance. We use Porter Cable power sanders with Fein vacuums for a perfect sand and to prevent as much dust as humanly possible during a sanding process. If your drywaller isn't sanding with a power sander they probably aren't doing it properly. Atlantic Drywall only uses the finest primers and finish paints. We will prepare your drywall area efficiently making sure nothing is disturbed by any paint and prepping the wallboard properly. Read more about our Priming and Finish Painting process.